Elway set several career records for passing attempts and completions while at Stanford and also received All-American honors. He was the first selection in the 1983 NFL Draft, famously known as the quarterback class of 1983, where he was taken by the Baltimore Colts before being traded to the Denver Broncos. In January 1987, Elway embarked on one of the most notable performances in sports and in NFL history, helping engineer a 98-yard, game-tying touchdown drive in the AFC Championship Game against the Cleveland Browns. The moment is known in National Football League lore as "The Drive." Following that game in Cleveland, Elway and the Broncos lost in Super Bowl XXI to the New York Giants. Elway and his twin sister were born in Port Angeles, Washington, to Janet (née Jordan) and Jack Elway, then the head coach at Port Angeles High School on the Olympic Peninsula. The family of five included sister Lee Ann, a year older than the twins. They moved the following year to southwestern Washington, where Jack was the junior college head football coach at Grays Harbor Community College in Aberdeen for five seasons. As a youth, Elway lived primarily in Missoula, Montana, and Pullman, Washington, when his father was an assistant coach at Montana and Washington State, respectively. In February 1976, Jack joined the staff at Palouse neighbor Idaho, but a month later became the head coach at Cal State-Northridge, a Division II program in Southern California. The family moved after John's freshman year at Pullman High School to the San Fernando Valley, where he played his final three years of football at Granada Hills High School in Granada Hills, under head coaches Jack Neumeier and Tom Richards. Despite missing five games with a knee injury as a senior, he ended his high school career with 5,711 passing yards and 49 passing touchdowns, and was named to the PARADE All America High School Football Team, along with future NFL stars, quarterback Dan Marino and running back Eric Dickerson. In 1979, he enrolled at Stanford University, where he played football and baseball. In his senior season in 1982, Stanford was 5-5 and needed to win its final game, the Big Game against California, to secure an invitation to the Hall of Fame Classic bowl game. With two minutes remaining in the game, Stanford was down 19-17 and had 4th-and-17 on their own 13-yard line. Elway completed a 29-yard pass and drove the ball downfield to the 35-yard line, where Mark Harmon kicked what appeared to be the winning field goal. However, the clock had four seconds remaining, so Stanford had to kick off. What followed is now simply known as "The Play", in which Cal players lateraled the ball, rugby-style, five times – two of them controversial – and scored a touchdown to win the game, 25-20. Elway was bitter about the game afterward, stating that the officials "ruined my last game as a college football player." Stanford athletics director Andy Geiger said the loss cost Elway the Heisman Trophy. Twenty years later, Elway came to terms with The Play, saying that "each year it gets a little funnier." Although Elway never led his team to a bowl game, he had an accomplished college career. In his four seasons (1979–1982) at Stanford, he completed 774 passes for 9,349 yards and 77 touchdowns. Stanford had a 20–23 record during his tenure. Elway's 24 touchdown passes in 1982 led the nation, and at the conclusion of his career, he held nearly every Pacific-10 record for passing and total offense. 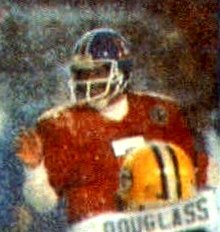 He won the Pac-10 Player of the Year honors in 1980 and 1982, was a consensus All-American, and finished second in Heisman Trophy balloting as a senior. In 2000, Elway was enshrined in the College Football Hall of Fame. In 2007, Elway was ranked #15 on ESPN's Top 25 Players In College Football History list. He passed for over 200 yards in 30 of his 42 collegiate games. Elway also excelled as a baseball player. He was selected by the New York Yankees in the second round of the 1981 Major League Baseball draft (52nd overall, six spots ahead of future Hall of Famer Tony Gwynn), and received $150,000 for playing for the Yankees' short season affiliate Oneonta Yankees in the New York–Penn League in the summer of 1982. Yankees scout Gary Hughes believed that had Elway concentrated on baseball "the sky was the limit … he would've been off the charts". Yankees owner George Steinbrenner—who aggressively sought Elway's services—reportedly planned to make him the Yankees' starting right fielder by 1985, which Elway—aware of Steinbrenner's opinion—later described as "a tremendous [and] exciting thought". Elway graduated with a bachelor's degree in economics, and he is a member of the Delta Tau Delta fraternity. Already age 19 when he entered as a freshman, Elway did not use a redshirt year at Stanford. In the 1983 NFL Draft, Elway was selected as the first overall pick by the Baltimore Colts. Elway was wary of playing for the Colts, among the worst teams in the league at the time, and his father advised him against playing for head coach Frank Kush, who had a reputation as a harsh taskmaster. While Elway preferred football, his agent Marvin Demoff later stated that baseball was "a true option" for him at the time. The possibility gave Elway leverage in negotiations with the Colts. After unsuccessfully attempting to negotiate a private agreement with the Colts in which Elway would cite his alleged desire to remain on the West coast to explain the team trading him, Elway publicly threatened to join the Yankees full-time if the Colts did not trade him; Demoff wrote in his journal, published three decades later, that "he would be a garbage collector before he'd play for Baltimore." Elway's refusal to join the Colts was controversial— Pittsburgh Steelers quarterback Terry Bradshaw denounced him, stating "you should play baseball … he's not the kind of guy you win championships with"—but many other NFL teams began negotiations with the Colts for the quarterback. One possibility was trading Elway for the San Francisco 49ers' Joe Montana, whose team had had a poor season in 1982. Another was a trade with the San Diego Chargers, which was negotiating a new contract with its star quarterback Dan Fouts. The New England Patriots were interested, but the Colts did not wish to trade Elway to a team in the same division. The Colts' general manager Ernie Accorsi wanted Elway as, Accorsi later said, he did not foresee the 1984 Draft as producing any first-round quarterbacks. Accorsi announced Elway as the team's choice as soon as possible during the 15-minute window on draft day, surprising observers. Elway that day reiterated his wish to not play for the Colts at a press conference, saying "As I stand here right now, I'm playing baseball". (When a reporter pointed out that the Yankees were not based on the West coast, Elway replied "They play baseball during the summertime".) The Colts, however, were interested in offensive lineman Chris Hinton, who the Denver Broncos had chosen as the fourth pick in the first round. On May 2, Colts owner Robert Irsay and Accorsi agreed to trade Elway for Hinton, backup quarterback Mark Herrmann, and a first-round pick in the 1984 Draft. The Colts controversial relocation to Indianapolis the following year would later prove to somewhat vindicate Jack Elway's concerns, and that franchise would largely struggle until the arrival of Peyton Manning during Elway's last season as a player. Elway joined Denver as one of the most highly anticipated athletes in the history of the NFL. The local newspapers ran a section that was called "The Elway Watch." Elway debuted for the Broncos in the 1983 season opener against the Pittsburgh Steelers at Three Rivers Stadium. He was sacked for the first time in his NFL career at the hands of linebacker and fellow Hall of Famer Jack Lambert. In his first game, Elway was relieved by veteran quarterback Steve DeBerg, who led the Broncos to a victory. Elway's second game was also on the road at Baltimore, and was spirited by his rejection of the franchise. In what would turn out to be Elway's only professional game in Baltimore, Elway was again relieved in a close game by DeBerg, who led the Broncos to another win. In early October, DeBerg was named the starter by third-year head coach Dan Reeves for the remainder of the season, but a shoulder injury brought Elway back a month later. Although the Broncos were playoff contenders for his early years, Elway went through the normal growing pains of a young NFL quarterback. In the 1986 season, Elway led the Broncos to Super Bowl XXI, after defeating the Cleveland Browns on a famous possession at the end of the fourth quarter that became known as "The Drive." (In a span of 5 minutes and 2 seconds, Elway led his team 98 yards to tie the game with 37 seconds left in regulation. The Broncos went on to win the game in overtime.) Elway and the Broncos started out the Super Bowl against the New York Giants very well, building a 10–7 lead and then driving to the Giants 1-yard line in the second quarter. However, the Broncos lost five yards on their next three plays and came up empty after kicker Rich Karlis missed the field goal attempt. From that point on, the rest of the game went downhill for the Broncos. Elway was sacked in the end zone for a safety on the Broncos ensuing possession, cutting their lead to 10–9. Then in the second half, the Giants scored 30 points and ended up winning the game 39–20. Still, Elway had an impressive performance, throwing for 304 yards and a touchdown, with one interception, while also leading Denver in rushing with 27 yards and a touchdown on the ground. In the 1987 season, Elway was selected to start in the American Football Conference's (AFC) Pro Bowl team and won the NFL Most Valuable Player Award. He went on to once again lead the Broncos to a victory over the Browns in the AFC title game, earning their second consecutive Super Bowl appearance, this one against the Washington Redskins. 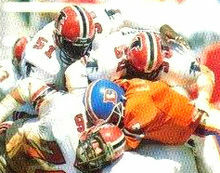 The game started out very well for Denver, and they built up a 10–0 lead by the end of the first quarter. At the time, no team had ever overcome a 10–0 deficit in the Super Bowl. But in the second quarter, the Redskins suddenly stormed back with a record 35 points, and ended up winning Super Bowl XXII 42–10. Elway did have a few highlights. His 56-yard touchdown pass to Ricky Nattiel after just 1:57 had elapsed in the game set a record for the fastest touchdown in Super Bowl history, at the time. He also became the first quarterback ever to catch a pass in the Super Bowl, recording a 23-yard reception from halfback Steve Sewell on a halfback option play. With a porous defense unable to stop the Redskins offense, Elway was forced to take more risks on the offensive end. As a result, Elway's performance was rather disappointing: just 14 out of 38 completions for 257 yards and one touchdown, with three interceptions. After recording an 8–8 record in 1988, Elway once again led his team to the Super Bowl after the 1989 season, with yet another win over the Browns in the AFC championship game, going on to face the San Francisco 49ers in Super Bowl XXIV. However this game ended even worse for the Broncos than their previous Super Bowl losses. San Francisco blew out Denver 55–10, the most lopsided score in Super Bowl history. Although Elway scored the only touchdown for his team on a three-yard run, his performance was abysmal: 10 out of 26 completions for 108 yards with no touchdown passes and two interceptions. But he didn't try to hide from the media after the game or downplay his dismal performance. And when he was asked if he wanted to go back to the Super Bowl after three losses, he responded that he wanted to go back every year, even if his team kept losing. Still by this point, many doubted that he would ever win a Super Bowl in his career. It took Elway another eight years, but he eventually led his team back to the Super Bowl, following the 1997 season. During the preseason American Bowl game in Mexico City, Elway ruptured his right (throwing arm) biceps tendon. It was treated non-surgically, and he returned to play 19 days later, and the team advanced to Super Bowl XXXII, Elway's fourth, where they faced the Green Bay Packers, the defending champions. Despite Elway completing only 11 of 22 passes, throwing no touchdowns, but one interception, the Broncos defeated the Packers 31–24, winning their first Super Bowl, after three failed attempts for Elway (and four for the team). In the 1998 season, the Broncos repeated this feat and Elway was named MVP of Super Bowl XXXIII, throwing for 336 yards and one touchdown with one interception, while also scoring a rushing touchdown in Denver's 34–19 win over the Atlanta Falcons. It was his last game, other than the 1999 Pro Bowl. On May 2, 1999, at the age of 38, Elway announced his retirement from professional football. Elway is regarded as one of the top quarterbacks ever to play the game. He has one of the best winning percentages in league history (148–82–1), and is tied for second most Pro Bowl selections for a quarterback (nine). As of 2016, he is sixth to Brett Favre, Dan Marino, Peyton Manning, Drew Brees, and Tom Brady in career passing attempts, passing yards, and completions. He also ranks seventh in career passing touchdowns, with 300. His four total rushing touchdowns in his Super Bowl games are the most ever by a quarterback. As of 2012, Elway and Tom Brady are the only quarterbacks to start in 5 Super Bowls. He is also the second player ever to score a rushing touchdown in four different Super Bowls (running back Thurman Thomas was the first). On September 13, 1999, Elway's number 7 jersey was retired by the Denver Broncos during halftime of a Monday Night game against the Miami Dolphins; that same night he was inducted into the Denver Broncos Ring of Fame. (Craig Morton, his direct predecessor in Denver, also wore number 7 and is in the Ring of Fame alongside Elway). He was the first Broncos player to have the five-year waiting period waived. Also in 1999 he was inducted into the Colorado Sports Hall of Fame. Also in 1999, Elway was ranked number 16 on The Sporting News' list of the 100 Greatest Football Players, the only player to have spent the majority of his career with the Broncos to make the list (Willie Brown, who began his career with the Broncos but spent more of it with the Oakland Raiders, also made the list). In 2005, TSN published another special feature honoring the 50 Greatest Quarterbacks. Elway was ranked third behind Johnny Unitas and Joe Montana. Elway was named the greatest athlete wearing the #7 by Sports Illustrated. Current Pittsburgh Steelers' quarterback Ben Roethlisberger, who grew up idolizing Elway and Joe Montana, wears number 7 in honor of Elway. Elway ended his career with a record 148 victories, since surpassed by Brett Favre, Peyton Manning, and Tom Brady for most wins by a starting quarterback. He finished his career with 774 rushing attempts, currently third in league history behind Randall Cunningham (775) and Michael Vick (873). Elway's 3,407 rushing yards ranks sixth all-time among NFL QB's behind Cunningham, Vick, Steve Young, Fran Tarkenton, and Steve McNair. On August 8, 2004, Elway was inducted into the Pro Football Hall of Fame. He was elected in his first year of eligibility. He was presented by his eldest daughter Jessica. He was inducted into the College Football Hall of Fame in 2000. In 1979, Elway was drafted out of high school by the Kansas City Royals to play baseball in Major League Baseball. George Brett, the future Hall of Fame third baseman for the Royals, is said to have remarked, "I hope this guy plays football." In the 1981 MLB Draft, Elway was selected by the New York Yankees in the second round. The following year, he played outfield in 42 games for the Oneonta Yankees of the Class A New York–Penn League. He had a .318 batting average, with four home runs, 13 stolen bases, and a team-high 25 RBI. In the 1983 NFL Draft, Elway was selected as the first overall pick by the Baltimore Colts, and on May 2, was traded to the Denver Broncos. On January 11, 1987, Elway executed "The Drive"—a last-ditch, five-minute, 15-play, 98-yard touchdown drive in the AFC Championship against the Cleveland Browns to tie the game late in the fourth quarter, leading to an overtime win by field goal (by Rich Karlis) for the Broncos. It included six passes made (nine attempted), five rushes and an eight-yard sack. He was named the NFL Most Valuable Player and the AFC Offensive MVP. Elway is the only player to throw for over 3,000 yards and rush for over 200 yards in seven straight seasons (1985–91). Elway was named the AFC Offensive MVP in 1993 when he passed for 4,030 yards and 25 touchdowns. He had a quarterback rating of 92.8. In 1997, Elway led the Broncos to their first ever Super Bowl win in Super Bowl XXXII. His three previous attempts in Super Bowls XXI, XXII and XXIV were unsuccessful. Elway is one of only two players to rush for a touchdown in four Super Bowls (XXI, XXIV, XXXII, XXXIII). Thurman Thomas is the other. On January 31, 1999, in Super Bowl XXXIII, Elway passed for 336 yards in a 34-19 victory over the Atlanta Falcons. He was named the Super Bowl MVP. Elway was selected to the Pro Bowl nine times during his 16 seasons with the Broncos, a franchise record. Over his professional career, Elway led Denver to 35 comeback wins in the 4th quarter & overtime, tied for third with Johnny Unitas. Elway's 148 wins place him fourth behind Peyton Manning, Brett Favre, and Tom Brady for career wins among quarterbacks. Elway was sacked 516 times, second to Favre for most times sacked in NFL history. Elway's 300 career touchdown passes places him tenth behind Favre, Dan Marino, Fran Tarkenton, Peyton Manning, Tom Brady, Drew Brees, Eli Manning, Philip Rivers, and Ben Roethlisberger. Elway is one of six quarterbacks to pass for at least 3,000 yards in 12 seasons; Favre, Marino, Brees, Brady and Manning are the others. On January 31, 2004, Elway was elected into the Pro Football Hall of Fame. Elway's No. 7 Stanford Cardinal jersey was retired on November 7, 2013, at halftime during the Stanford-Oregon game. Elway was co-owner of the Arena Football team Colorado Crush, from their inception in 2002 until the cancellation of the Arena Football League after the 2008 season. In February 2007, Elway was elected chairman of the AFL's executive committee. On August 4, 2009, the Arena Football League announced an indefinite suspension of operations. Elway was one of the 17 remaining franchise owners that voted to suspend operations indefinitely. Elway owned five auto dealerships, called John Elway Autos, in the Denver area. He sold them to AutoNation Inc. in 1997 for $82.5 million. In December 2006, Elway ended a nine-year licensing agreement with AutoNation, removing his name from Denver-area dealerships. At the time, Elway said the move could allow him to get back into the auto business under his own name. He still owns two Toyota Scion dealerships, one in Manhattan Beach, California and another in Ontario, California, a Chevrolet dealership in Englewood, Colorado, and a Chrysler Jeep dealership in Greeley, Colorado. 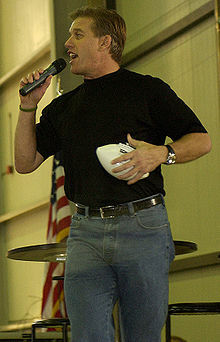 In September 2008, Elway became the spokesperson for OpenSports.com. Elway had LASIK eye surgery and endorsed Icon LASIK in the Denver area in November 2008. Elway currently offers his commentary on the Broncos and the NFL season as a whole Friday mornings during the football season on 87.7 The Ticket in Denver. In December 2010, Elway expressed interest in working as the Broncos' top football executive, after having dinner with Broncos owner Pat Bowlen. However, he expressed no interest in being a head coach or general manager after Josh McDaniels' firing, saying, "I'm not interested in being a head coach. I'm not interested in being a general manager. I don't have that kind of experience to be able to pick those players day in and day out and such." On January 5, 2011, Elway was named general manager and executive vice president of football operations of the Broncos, with the final say in all football matters. In this capacity, he reports to team president Joe Ellis and is the immediate supervisor for the head coach of the team. General manager Brian Xanders was actually retained, but served mostly in an advisory role to Elway. Xanders left the team after the 2011 season, and Elway assumed the role of general manager which gave him complete control over the football side of the Broncos operation. Under Elway's management, the team signed free agent quarterback Peyton Manning who had just been released by the Indianapolis Colts. In four seasons from 2012 to 2015, the Broncos won four division titles, two AFC Championships, and reached Super Bowl XLVIII where they were soundly defeated 43-8 by the Seattle Seahawks despite holding the regular season's top offense. Elway responded to the Super Bowl loss by signing defensive end DeMarcus Ware, cornerback Aqib Talib, and safety T. J. Ward for the 2014 season. After losing in the divisional playoffs to the Indianapolis Colts, Elway dismissed John Fox, who had won four divisional championships in his four years as Broncos head coach. Elway hired Gary Kubiak, his former backup quarterback and former Broncos offensive coordinator, as the new head coach for the 2015 season. Elway and Kubiak also brought back Wade Phillips, a former Broncos head coach, for his second stint as the team's defensive coordinator. Elway won a third Super Bowl as part of the Broncos franchise, when on February 7, 2016 Denver defeated the Carolina Panthers 24-10 in Super Bowl 50. This gave him his first Super Bowl win as Executive VP/GM, to go along with the two he won as the team's quarterback. Elway married Janet Buchan, who attended Stanford University and competed on its swimming team, in 1984. They separated in 2002 and divorced in 2003. They have four children: Jessica, Jordan, Jack, and Juliana. Jessica Gwen Elway was a student at Stanford University. During her freshman year, she was a member of the Stanford women's basketball team. However, she did not rejoin the team for her sophomore year. Jessica gave an introduction speech for her father at his induction into the Pro Football Hall of Fame in Canton, Ohio, becoming the first daughter to ever introduce her father as an inductee into the Pro Football Hall of Fame. John Albert "Jack" Elway III played quarterback at Cherry Creek High School in Colorado, receiving All-State honors his senior year, graduating in 2008. John worked as the quarterback coach for Cherry Creek for Jack's senior year. Jack signed to play quarterback for Arizona State University but left the team in April 2009. ASU's head coach Dennis Erickson was his grandfather Jack's first offensive coordinator, from 1979–81, at San José State, the elder Jack's first Division I head coaching job. Elway's twin sister, Jana, developed lung cancer and died at the age of 42 in the summer of 2002. John's father, Jack, died of an apparent heart attack a year earlier. Elway met former Oakland Raiders cheerleader Paige Green in 2005 at a celebrity golf tournament held by former Raiders running back Marcus Allen in Los Angeles. They were engaged in Italy in September 2008, and married in August 2009. ^ a b Pierce, Oliver (January 23, 1987). "From Pullman to Pasadena". Idahonian. Moscow. p. 17. ^ "Jack Elway joins Idaho grid staff". Spokesman-Review. February 18, 1976. p. 16. ^ "Idaho staff adds Elway". Kingman Daily Miner. Arizona. Associated Press. February 18, 1976. p. 14. ^ "Cal-Northridge names new coach". Tuscaloosa News. Alabama. Associated Press. March 25, 1976. p. 18. ^ LYNCH, JOHN (October 12, 1986). "THE HIGH SCHOOLS : Hampton Does Unto Defenses Before They Can Do Unto Him" – via LA Times. ^ a b Reilly, Rick (May 10, 1983). "Elway's 'just one of the boys'". Eugene Register-Guard. (Denver Post). p. 1C. ^ Rich, Tosches (July 26, 1979). "Jack Elway now a troubled man". Ellensburg Daily Record. UPI. p. 10. ^ Van Sickel, Charlie (December 5, 1980). "Walden: 'That's great'". Spokane Daily Chronicle. p. 28. ^ Cohen, Haskell (December 31, 1978). "Parade's All American High School Football Team". Spokesman-Review. Parade magazine. p. 12, Parade. ^ "18th Round of the 1979 MLB June Amateur Draft". baseballreference.com. Retrieved October 19, 2010. ^ "4th Round of the 1979 MLB June Amateur Draft". baseballreference.com. Retrieved January 6, 2011. ^ Hecht, Steve (June 28, 1979). "NCAA ruling spurs Marino to choose Pitt over pros". Pittsburgh Post-Gazette. p. 10. ^ Miller, Johnny (November 18, 2007). "Stanford's Elway bitter after Big Game loss to Cal in 1982". San Francisco Chronicle. ^ Krentzman, Jackie (November – December 2002). "And The Band Played On". Stanford Alumni Magazine. ^ Rotto, Ray (October 17, 1982). "the delicious dilemma of John Elway". Tuscalsoosa News. Family Weekly magazine. p. 6, Family Weekly. ^ a b c d e "Elway to Marino". 30 for 30. Season 2. April 23, 2013. ESPN. ^ "Delta Tau Delta: Beta Rho Chapter – Stanford University". Retrieved September 22, 2011. ^ a b Looney, Douglas S. (August 15, 1983). "In Denver, delirium Is spelled E-l-w-a-y" (PDF). Sports Illustrated. p. 21. Archived from the original (PDF) on October 18, 2015. ^ "Elway hurt; DeBerg directs Broncos win". Gadsden Times. Alabama. Associated Press. September 5, 1983. p. B4. ^ The Colts moved to Indianapolis prior to the 1984 season. Although Baltimore received a new franchise that commenced play in 1996, that team (the Ravens) only played the Broncos once, in Denver, during Elway's final three professional seasons. ^ "Denver's DeBerg keeps rescuing $5 million man". Palm Beach Post. wire services. September 13, 1983. p. D6. ^ "Struggling Broncos bench Elway, DeBerg starter for rest of season". Montreal Gazette. UPI. October 6, 1983. p. D-14. ^ "Elway back as starter after Broncos lose DeBerg". Montreal Gazette. news services. November 8, 1983. p. D10. ^ Cour, Jim (December 23, 1983). "Broncos to bench Elway, start DeBerg". Evening News. Newburgh-Beacon, New York. Associated Press. p. 2B. ^ "NFL Career Passes Completed Leaders". Pro Football Reference. Archived from the original on November 3, 2016. Retrieved November 3, 2016. ^ "Football's 100 Greatest Players". The Sporting News. Archived from the original on November 5, 2005. Retrieved September 22, 2009. ^ Wilbon, Michael (January 23, 2006). "Big Ben, Already Like Clockwork". The Washington Post. Retrieved May 6, 2010. ^ "John Elway". College Football Hall of Fame. Football Foundation. Retrieved October 11, 2010. ^ "Six QBs picked in first round shared history". CNN. Retrieved May 6, 2010. ^ a b "John Elway: Master of the Drive". CNN. Retrieved May 6, 2010. ^ "John Elway Minor League Statistics & History". Baseball-Reference.com. June 28, 1960. Retrieved October 11, 2010. ^ "Sporting News – NFL – NCAA – NBA – MLB – NASCAR – UFC – WWE". Sporting News. Archived from the original on September 20, 2008. ^ "Broncos Official Website, Ring of Fame page". Denverbroncos.com. Retrieved October 11, 2010. ^ "Hall of Famers » JOHN ELWAY". Profootballhof.com. Retrieved October 11, 2010. ^ Kurt Svoboda. "Stanford to Retire Elway's No. 7". Archived from the original on October 13, 2013. Retrieved November 18, 2013. ^ "Sports – CBSSports.com Sports News, Fantasy Scores, Sports Video". Cbssports.com. Archived from the original on January 26, 2012. Retrieved October 11, 2010. ^ "Home". Elway's. Retrieved March 16, 2019. ^ "John Elway signs with OPEN Sports.com". Reuters. September 3, 2008. Retrieved October 11, 2010. ^ "John Elway expresses interest in joining Broncos' executive staff". ESPN.com. ^ Klis, Mike; Legwold, Jeff (January 5, 2011). "Broncos officially announce Elway hire, promote Ellis to president". Denver Post. ^ "John Fox's role on Broncos not forgotten, but much about Super Bowl will be". Chicago Tribune. Retrieved February 9, 2016. ^ "Wild Ride: Tale of Super Bowl 50 champs Broncos". Sports Illustrated. ^ a b c Husted, Bill (September 26, 2008). "John Elway to marry ex-Raiders cheerleader". The Denver Post. Retrieved October 11, 2010. ^ "John Elway Joins Cherry Creek as QB Coach – 23 Aug 2007". kdrv.com. August 23, 2007. Archived from the original on July 16, 2011. Retrieved October 11, 2010. ^ "Jack Elway Signs Letter of Intent with ASU – 6 Feb 2008". kdvr.com. February 6, 2008. Archived from the original on July 16, 2011. Retrieved October 11, 2010. ^ "Jack Elway, son of John Elway, leaving Arizona State Sun Devils football team". espn.go.com. ESPN. April 7, 2009. Retrieved October 11, 2010. ^ "John Elway engaged to former Raiders cheerleader: Broncos". The Rocky Mountain News. September 26, 2008. Retrieved October 11, 2010. The Associated Press, "Clock runs out on Elway", Arizona Daily Wildcat, May 3, 1999. Ivan Carter, "KC helped make Elway a star", The Kansas City Star, August 8, 2004, p. C8. Wikimedia Commons has media related to John Elway.